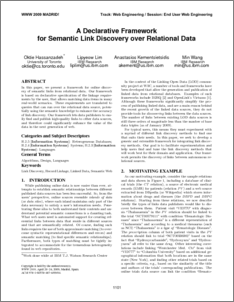 In this paper, we present a framework for online discovery of semantic links from relational data. Our framework is based on declarative specification of the linkage require- ments by the user, that allows matching data items in many real-world scenarios. These requirements are translated to queries that can run over the relational data source, potentially using the semantic knowledge to enhance the accuracy of link discovery. Our framework lets data publishers to easily find and publish high-quality links to other data sources, and therefore could significantly enhance the value of the data in the next generation of web.